CityMaps2Go seems like a travellers map dreams come true. When I travel I love to have a few good maps or tourist books about the place I’m going. Not only to find my way around the city but also because it’s easy to miss POI while you’re in unknown territory. There are always obvious places to visit, like you wouldn’t miss the Eifel Tower while in Paris, but there are some really good places to visit and things to see that are not so touristy and might get overlooked otherwise. Today I stumbled on CityMaps2G, which has it all; free maps, which you can use offline, POI inside the app and even Wikipedia travel guides to get detailed information on certain places. It offers 6,700 free maps from cities all over the world. You can download them (for free!) in the app along with the Wikipedia travel guides and everything is usable offline. Which is absolutely fantastic as you often don’t have access to the internet when you’re exploring. 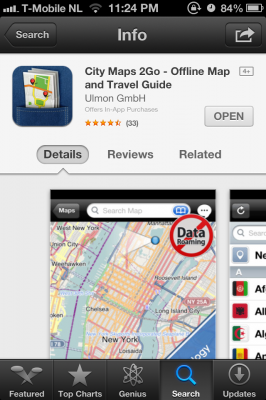 The app comes with unlimited downloads of maps, Wikipedia travel guides and there are no in-app purchases needed. Usually this app goes for $2,99 in the app store (for Iphone, I don’t have access to android stores but have a look there too if you’re on android). but today the app is free. I have to admit that free is always tempting but not all free for a day apps are good. However CityMaps2Go seems really awesome. I haven’t been able to test it out other than my home town but I have to say it works pretty good. I really enjoyed seeing all the POI pop up on the map. It also has an option to sign up and share your rating of places and even add friends so you can share your travel experiences with them through the app. All in all a very useful and versatile app that I’ll be using a lot. I think it’s safe to say I would totally get this app even if it wasn’t free. It seems so useful in many different places and for various reasons. So if you want to get your copy and check it out for yourself you can find it in the app store here. Make sure you check if it’s still free before you download, even though I would totally pay for it when it’s not free that might not be the case for all of you and you don’t want to end up being charged for something you forgot to double check if it was free.